You want to have the latest Windows version 8.1 and also to be able to check your Windows Experience Index ? In before windows 8.1 we can find rate experience in system manager. but in windows 8.1 that menu not shown. ChrisPC Win Experience Index software and you will get back the Windows interface that you are already familiar from Windows 7 and Windows 8. 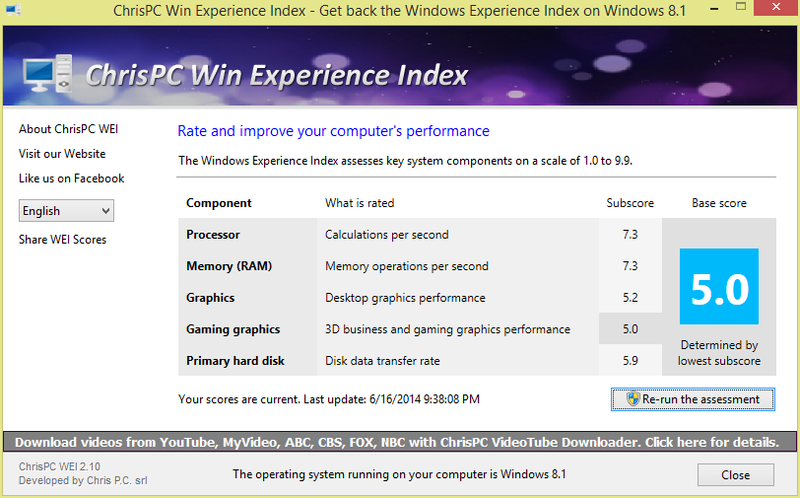 Fast access to Windows Experience Index scores on Windows 7, 8, 8.1. Re-run assessments with a single click on Windows Vista, Windows 7, Windows 8 and Windows 8.1.